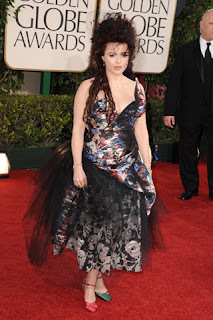 Last night saw the 68th annual Golden Globe Awards. As the first award show of the season (don't ya just love this time of year! ), we were keen to see what styles the fash pack would be sporting. On a side note, can we just say how elated we are that Colin Firth (The King's Speech) and Natalie Portman (Black Swan) took top honours. Our favourite look of the night had to be Angelina Jolie's Atelier Versace, emerald green gown. Slinky, and in such a wow colour, it would be a difficult dress for many to pull off, but naturally Angelina does spectacularly. Catherine Zeta-Jones (Monique Lhuillier), Mila Kunis (Vera Wang) and Elisabeth Moss (Donna Karan) also opted for green. Colour was definitely HOT last night, from Kyra Sedgwick's Emilio Pucci orange dress to January Jones' bright red Versace gown. We loved Heidi Klum's 70s' inspired Marc Jacobs gown, we think she worked the halterneck and scarf design particularly well. Another firm favourite of the night was Anne Hathaway. She looked divine in a backless, sparkly, Armani Prive gown. Oh, how we'd love to be her right now. Ah-mazing! And the fashion faux pas? Let's face it, there were a few. Lea Michelle in what can only be described as a pink bridesmaid dress, Helena Bonham-Carter with different colour shoes (yes, seriously!) and Tilda Swinton in a white shirt and lemon skirt combo (? ).